X Games. 195 Land. Discuss. 195 Land aerial. Photo © RIDOT. 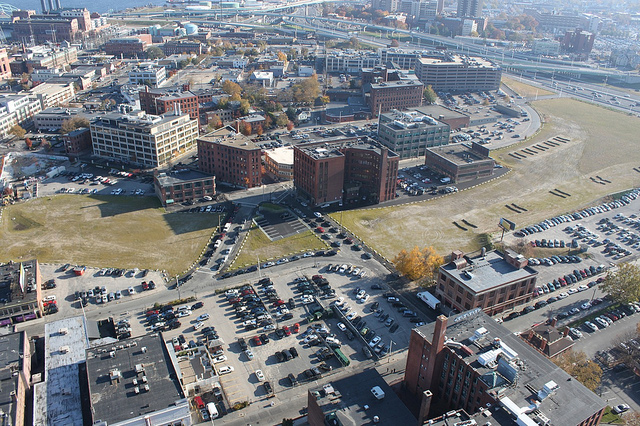 The original X Games were held in Providence on the undeveloped Capital Center land. We could bring them back to our new redevelopment district. The X Games cities have been assigned through 2015, the next slot we could go for is 2016. Until such time as there are buildings on the lots, I’d hope that the Commission would be open to any reasonable proposal for temporary use of the land. Aside from the amount of Axe Bodyspray the spectators would bring with them, bringing the X Games back seems reasonable. David, hopefully by 2020 all the parcels will be filled with buildings. Ha, I made myself laugh! Eric, we will need some counter Axe Bodyspray plan. I nominate Betaspring to come up with some sort of neutralizing technology, in app form. This is a good idea. Along those lines we should be considering other uses for the land. Like for a permanent stadium for the NE Revolution or other sports team. RISD Museum temporary annex and sculpture garden with cocktails in the evening. 195 land. Discuss. Competing Samsung and Apple temporary pop-up retail stores. 195 Land. Discuss. The Verge: Samsung to expand its ‘Pop-up’ retail stores, directly taking on Apple? I couldn’t agree more with “9/21/38.” This city needs a major sports team. The NE Revolutions is perfectly suited to be a successful franchise, and the 195 land offers up a unique opportunity. Major League Soccer is one of the fastest growing sports in the country. (Even Providence Equity believes so–they own the majority stake in broadcasting MLS)… Just imagine the streets filled up with pedestrians walking to and from the stadium. I really am surprised that there hasn’t been more of a concerted effort to lure Kraft to Providence. As for where on the 195 parcel, I’d argue that the vacant land closet to 195 is the best spot. Of course, Allens Ave would probably be most ideal. I think if they were to put up some sort of stadium in Providence, downtown wouldn’t really be the best location especially since there just wouldn’t be enough room unless blocks were torn down. It’s bad enough that the mall dominates a majority of the land. I think it would be nice if a street in the Jewelry District (maybe South St or Richmond St) were purposely made into a street like Atwells Ave or Thayer St with a lot of shops and restaurants. This would create a lot of development potential, especially for the 195 land. Maybe even a street mall (using the old westminster one as what NOT to do)? Actually, there wouldn’t be any need to tear down anything at all (plenty of surface lots that could be developed). Also, MLS stadiums aren’t much bigger than 30,000 seats, compared to Gillette Stadium at 70,000. The footprint would be significant, but nothing compared to Providence Place…regardless, Providence could use a major league sports team. I can’t think of a bigger waste of space than a sports stadium, especially for soccer. We have the Dunk, why would you want to put in something that would compete with an established indoor arena? Stadiums are huge money losers when you look at the public financing involved. See the hockey arena in Kansas City, Bengals Stadium etc. Not to mention the fact that it would be a large structure that sits unused for a majority of the time. Seeing how this general area is on the street car line, I think this would be a great idea as long we get the street car line by then. Or at all. Dream on, stadium fans. The last thing we need is a couple acres bearing an inevitably publicly financed stadium sitting idle 340 or so days a year. Talk about a wastedland. The Atwells/Thayer notion is a good one. Build it, maybe the shoppers will come. The Jewelry District’s already got a nice, wide selection of good places to dine, nosh, guzzle and swill. Or it could be the incentive to ensure that it happens quickly. If it was gonna be anywhere on this land though, it’d probably make the most sense along 95, people could just take exit 20 and drive straight to it, reducing traffic issues, and it would be visible to people on the highway passing through Providence, which would make a nice statement about the city. Would it fit there though? I’d have to look at the map again. I really wish Narragansett could move their brewery to the Jewelry District, I think it would really add to the momentum, but I know they’re eyeing the old Capitol Records building. … number of soccer fans in the area. I wouldn’t mind actually seeing the entire newly opened space be turned into a series of linking parks with connecting bike path, similar to what has taken place in Boston in the area of the former I93 land vacated by the “Big Dig,” and current surrounding land (i.e. surface parking lots) developed into buildings instead. Such a connection of parks would act as a dedicated (and much needed) pedestrian/bicycle link from the South/West across a future Providence River Pedestrian Bridge and to the East Side. Adjacent land, most of which, currently exists as surface parking lots and would be developed into buildings. Though I am hopeful for the future of this land, its most likely going to take years if not the better part of a few decades to be fully developed (ex. Capital Center) and this seems to be a more plausible suggestion. For a clearer image, Andy, search for cityWALK on the ever informative website GCPVD.org. And join in the push to make cityWalk a reality in Providence! Info about cityWALK is here. 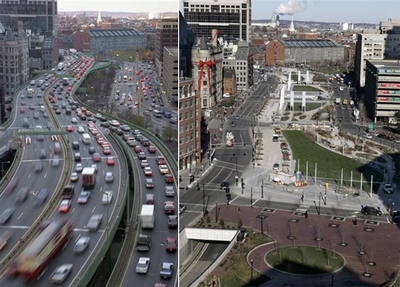 It would be a complete waste to replicate Boston’s Big Dig park corridor for the 195 land. It would be a manicured wasteland. There’s already too much park downtown. Much of the current river walk is empty most of the time. The exception is during a Waterfire or other special events. The same is so for the Roger Williams Memorial and somewhat with India Point. What’s needed is higher density with people living and working directly adjacent to parks to use and appreciate. This notion that new parks are needed everywhere in cities and that there’s not enough “green” in urban areas is a suburban concept. A version of cityWALK would be a better alternative, as the majority of the land would be reserved for buildings. something should be done with the Roger Williams Memorial park. But it took 115 years for us to begin to save Burnside Park (A once a week Beergraden two mon. out of the years!) from being a combat zone. When you look at the arial photos it almost looks like the river has overflowed and flooded the old 195 land. It looks like a small Missippippi river has been created. Wasn’t there a proposal by someone to create a new canal on this land. If that happenned we could expand waterfire and get more Gondola’s. They should build a stadium that would include an outdoor Velodrome (cycling track) and soccer field in the middle … A true multi use venue, possibilities are endless. Please.